In my last post in this series, I promised to examine the neo-Platonist influences in Eastern Orthodoxy. If I knew then what I knew now – or didn’t know then what I don’t know now, I wouldn’t have made such a promise. As it turns out, trying to pin this issue down has a number of problems. While there are a great many sources discussing Augustine’s neo-Platonist orientation, there are very few – that I have found – discussing in any specificity the neo-Platonist influence on the Eastern Church. And, of the sources I did find, I found a great deal of disagreement. What I will do in this post is lay out a sketch of the issue as I currently understand it, which if nothing else will show what I don’t know, hopefully inviting input from others. First, neo-Platonism refers to the 3rd century revival of Platonism, mainly as taught by Plotinus, who apparently was trying to clarify some misunderstood elements of Plato’s writings. Just as contemporary philosophy has impacted Western theology, neo-Platonism also had an influence on some of the Greek-speaking early theologians, as well as on such Western theologians as Augustine. 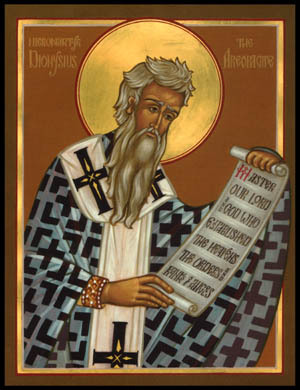 Many of the Church Fathers showed signs of neo-Platonist thinking, including Gregory of Nyssa, Origen, Maximus the Confessor, and the most-often connected with neo-Platonism, the fellow known as Pseudo-Dionysius, also known for developing the Eastern Church’s Apophatic approach to theology. While there are certainly neo-Platonic concepts used in the Eastern church, I can’t say at this time whether the church was influenced by the neo-Platonists, or whether they are correct in that they only used those concepts to convey a pre-existing theology. This Eastern way of looking at the development of theology – that the formation of Orthodox theology and Tradition only clarified the Apostolic faith that the church always believed – is if nothing else, convenient. It also appears somewhat circular, based on the belief that the Orthodox Church is the one and only true church and the belief that God is preserving in the church the Apostolic faith. It seems to assume that anything the Orthodox Church believes is necessarily Apostolic and correct, even though there have been a number of disagreements over the years. The belief that the Eastern Church is the one true church also appears somewhat circular; they have the Apostolic faith because they are the one true church, and they are the one true church because they have preserved the Apostolic faith. Of course, if they are correct, they don’t need a better argument. While I am obviously impressed by much in the Eastern traditions, there are elements of Orthodoxy that I have a hard time with, which I will try to outline in coming posts. This entry was posted on Sunday, January 3rd, 2010 at 9:43 pmand is filed under . You can follow any responses to this entry through the RSS 2.0 feed. You can leave a response, or trackback from your own site. Just read about Neo-Platonism itself and you’ll be able to see its influence on Eastern Orthodoxy. It’s filled to the brim with it. And most of Orthodoxy’s claims are very circular, just as you said.It’s basically we’re the one, true church because we say we are, and we say we are the one, true church because we are. They recognize ‘truth’ as what the people before them believed. If 1700 years ago, a lone dissenter believed something off the wall but got a big following and it was accepted, it became ‘truth’ for the next generation and so on and so on. as a graduate student studying Neoplatonism, I can at least confirm that the roots of Neoplatonism in christian theology as a whole goes back to the translations of Plotinus made by Victorinus which found their way to Augustine. However, the subsequent influence of neoplatonic authors reintroduced into the Latin west, such as Proclus and Damascius, continued to influence catholic doctrine, upto St. Thomas Aquinas, who, for all his alledged Aristotelianism, can be well situated as a Neoplatonic concordist. however, I am at a similar loss with regard to finding information specific to Eastern Orthodoxy and Neoplatonism. It would be interesting to delve into the influence the Pseudo-Dionysius has had on the eastern church itself, since his impact on the Catholic church has been nothing short of immense. We do know that there is one true Church, but it is a Church made up of believers in all Christian churches. We would also say that there are many non-believers within those churches as well. We (as Lutherans) believe we know the Truth, but we believe that others do as well.